Nuakhai, the harvest festival will be observed with cheer and zeal in western Orissa on 20 September. This festive fervour will continue for the next few days. Nuakhai is the most awaited event for the people of Sambalpur, Jharsuguda, Kalahandi, Bolangir and Koraput. Nuakhai is a major festival of Western Orissa. 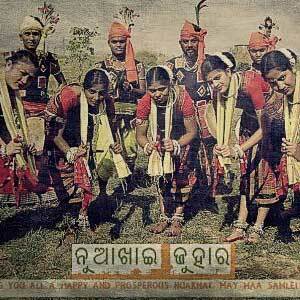 The festival is observed by the mass over the entire Western Orissa, particularly Sambalpuri cultural area. Nuakhai is observed welcoming the new rice-paddy “Aant Dhan” of the season. According to Hindu calendar it is observed on “Bhadraba Sukllapakshya Panchami Tithi” (August-September), the day after Ganesh Chaturthi. This is the most important social festival of Western Orissa. Nuakhai is also called Nuakhai Parab or Nuakhai Bhetghat. The word nua means new and khai means food, so the name means the farmers are in possession of the newly harvested rice. The festival is seen as a new ray of hope, held the day after the Ganesha Chaturthi festival. It has a big significance for farmers and the agricultural community. The festival celebrated at a particular time of day which is called lagan. Arisa pitha is prepared to celebrate this festival. When the lagan comes, the people first remember their village god or goddess and then have their nua. The significance of this festival lies more in its socio-cultural content rather than its religious orritualistic aspect. NUAKHAI is nearly akin to the Onam Festival of Kerala or the Bhogali Bihu of Assam. Related to the agrarian life and activities of the people of more than ten districts of Western Orissa, NUAKHAI is a prayer for plenty and prosperity, a way of thanksgiving to Mother Earth and the ever benign and bountiful nature. In the olden days, this festival was being observed at the behest of the feudal lords in the princely states of Orissa like Sambalpur, Bolangir, Gangpur, Bonai, Bamanda, Kalahandi, Sonepur, Boudh, Attmallik and other smaller tributaries and zamindaries. In each of these states, the ruling houses had their presiding deities. Samaleswari in Sambalpur, Pataneswari in Bolangir, Manikswari in Kalahandi. NUAKHAI in each of these states was being observed according to the “State Almanac”. There was no common day for this culturally contiguous vast area in Western Orissa. But for over a decade now, to bring about uniformity, by common consensus of the people, a predetermined day has been identified for NUAKHAI and that is the day after Sri Ganesh Chaturthi, the fifth lunar day during the bright fortnight of Bhadrav. This unanimity of a common day has helped people away from home to visit their native places. A single day has been declared as holiday by the State Government of Orissa in the entire state of facilitate grand celebrations. Samastanku Nua Khai ra hardika abhinandana.